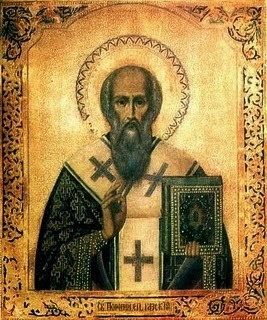 Bishop of Gaza in Palestine, b. at Thessalonica about 347; d. at Gaza, 26 February, 420. After five years in the Egyptian desert of Scete he lived five years in a cave near the Jordan. In spite of his impaired health, he frequently visited the scene of the Resurrection. Here he met the Asiatic Mark, at a later date a deacon of his church and his biographer. To effect the sale of the property still owned by Porphyrius in his native city, Mark set out for Thessalonica and, upon his return, the proceeds were distributed among the monasteries of Egypt and among the necessitous in and around Jerusalem. In 392 Porphyrius was ordained to the priesthood, and the relic of the Holy Cross was intrusted to his care. In 395 he became Bishop of Gaza, a stronghold of paganism, with an insignificant Christian community. The attitude of the pagan population was hostile so that the bishop appealed to the emperor for protection and pleaded repeatedly for the destruction of pagan temples. He finally obtained an imperial rescript ordering the destruction of pagan sanctuaries at Gaza. A Christian church was erected on the site of the temple of Marnas. In 415 Porphyrius attended the Council of Diospolis. The "Vita S. Porphyrii" of Mark the Deacon, formerly known only in a Latin translation, was published in 1874 by M. Haupt in its original Greek text; a new edition was issued in 1895 by the Bonn Philological Society.